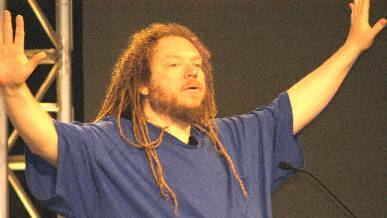 Many moons ago, in what seems like a previous life, there were people I “followed” – William Gibson, who wrote Neuromancer, Neil Stephenson, who wrote Snow Crash and Cryptonomicon , and Jaron Lanier (pictured above), who is accepted as the father of virtual reality. Others in the cyberpunk movement popped on to my radar and dropped off, but these three seemed to pop up again and again. This was both linked to my job at the time and to a personal interest, sparked by my nerdy DH, in computing and the development of the internet, way back before the days of the URL and easy www access. Although I have read most of what Gibson has written since, I hadn’t thought of these guys in a while (well, since Gibson’s last book, anyway.) Imagine my surprise to see a familiar blond dreadlocked face peering out at me from my Sunday Times! Jaron Lanier, it seems, has become disillusioned with the internet. As someone who runs a large internet site I find his comments particularly thought-provoking, and I find myself agreeing with what I read and wanting to read more. It sounds to me that his new book, You Are Not a Gadget: A Manifesto, may have some interesting things to say and is on my “to read” list.